More than 70% of all pregnant women complain of some type of sleeping problem. 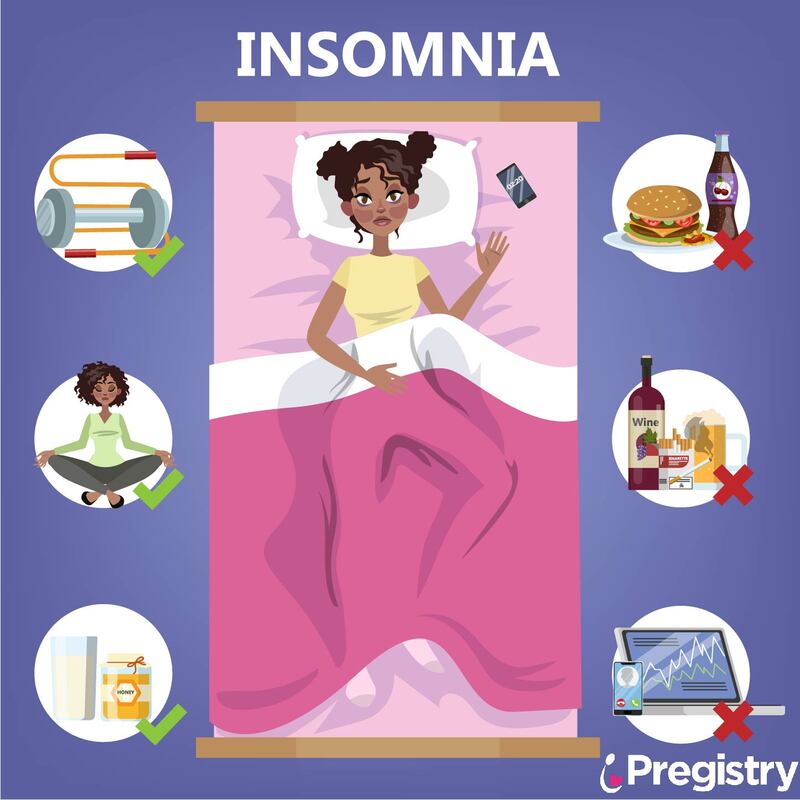 The most frequently reported issue is insomnia. There are a number of reasons that explain the occurrence of insomnia during pregnancy, as will be discussed below. Contrary to popular belief, maternal problems with sleep don’t impact the baby’s development. If you have difficulty falling asleep or wake up frequently, rest assured (no pun!) that you are not alone. Here are some facts you need to know. What causes insomnia during pregnancy? During pregnancy, your body undergoes many changes which may impact your sleeping pattern. The increasingly growing size of your abdomen can be a major factor, since it can produce heartburn and frequent urination. Vivid dreams and hormonal changes are common factors that may alter your sleep. Many women also complain of abdominal pain and back pain. Any of these conditions can greatly disturb your sleep. What to do if you have insomnia during pregnancy? First, try to relax. Insomnia does not harm your baby. Some women worry too much and this impacts their emotional wellbeing. If you are going through emotional stress, talk to your partner, friend, or health care professional and try to stay calm. Before you go to sleep, take a warm bath or ask your partner for a massage. Eat your meals at regular intervals, which will help decrease your chance of having heartburn. Ideally, you should have a good time interval between dinner and going to bed, since a full stomach will keep up your energy level and prevent you from falling asleep. Also, you should drink liquids some time prior to going to bed, so that hopefully you will not need to run to the bathroom multiple times. Avoid chocolate and caffeine before going to sleep. Exercising is important for your sleep and overall health. Try to be physically active at least 30 minutes per day. Kegel exercises are important and easy to do at home. Meditation and yoga are also great to help your mind and body. Create a nice environment to sleep. For example, adjust the room temperature and use a scented candle of your favorite fragrance. If you can’t sleep, engage in a soothing activity such as reading or watching a TV show. Consider sleeping during the day, if possible. Napping is a good habit during pregnancy, but avoid long naps as you may then have trouble falling asleep at night. Do not count the hours you sleep. It is perfectly ok to sleep a little more during pregnancy! Do not take any over-the-counter medications for insomnia. Most prescription medications and some herbal products can harm your baby. Before taking any medication, always consult to your doctor, nurse, or midwife. Our guest bloggers come from all walks of life to share their expertise and experience from the worlds of Pregnancy and Lactation. If you wish to submit a blog post for consideration, please write to hello@pregistry.com. When do Healthcare Providers Induce Overdue Babies? What’s The Impact Of Air Pollution On Pregnancy? Is It Safe To Carry My Toddler Around When I’m Pregnant?